An Islamic city should have a divine atmosphere. It means that you should remember God when you walk in the city. Also, it should have connections with nature. The meanings of symbols and colors should be realized. The effects of seeing certain geometrical shapes such as triangles, curves and dead-ends should be understood. The fact that the city has to be built in what direction and where the center should be, are considered. Islamic architecture deals with these issues. Ethical and spiritual aspects should be also observed. For instance, the number of houses in one street is also important. How many houses should be there? Imam Mahdi (PBUH) on his reappearance will be concerned about architecture, I assure you, and he will make many reforms in architecture. How should the quality of a city be in Islam? Its security, liveliness, visual decorations, defining restrictions all for which we have hadiths about. Humans should not feel inferior in front of buildings. In Islam, mosques were at the center and different other shops were around mosques like, herbalist’s, perfumers and then the bazaar and at the end of the bazaar we had the tinkers. Because they would make a lot of noise. All of this was based on principles. It depended on purpose and logic. But nowadays, they don’t what they are doing, the bazaar does not have its previous function. For example, first you see a boutique and then a cellphone’s shop, then a pizzeria and the shops are irrelevantly situated to the end. An Islamic city is the one in which the defined relation of humans and God takes place favorably. The city and her elements should remind one of God. The Islamic symbols should be represented in the city. Imam Sadiq (PBUH) says: “He who remembers the Almighty and Glorious God a lot, God will like him and whomever remembers God a lot, there will be two bills of good deeds recorded for him. Another topic in Islamic urbanization is the relation with regard to time. One has to know what time it is. One should know when the sunset is, one has to see the sunrise, and this is a mental and physical need as well as a religious one. He needs to know when the sun rises. Read this verse of the Quran: “Patiently, then, persevere: for the Promise of Allah is true: and ask forgiveness for thy fault, and celebrate the Praises of thy Lord in the evening and in the morning.” Qalib Abdullah has narrated from Imam Sadiq (PBUH) on the above mentioned verse that “The purpose is to pray before the sunset and sunrise which are proper times for having requests fulfilled.” But nowadays, one is inside the house and does not understand when the sun rises and when the sun sets. 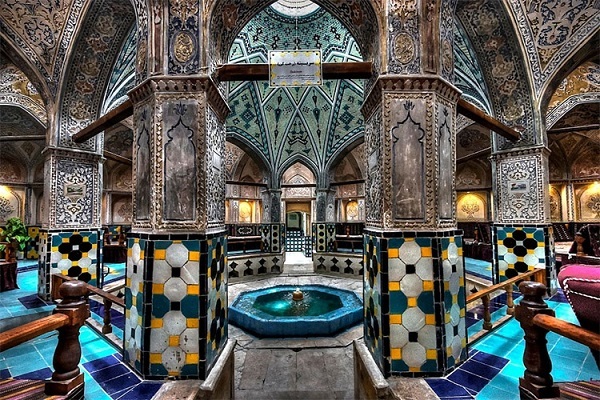 In Islamic architecture, you should do something to have connection with nature. He should see the sunset and the sun rise, the days of the week, he should see the moon. He does not see the moon in the sky. The moon is behind these apartments. Imam Sadiq and Imam Baqir (Peace Be upon Them) say that if you want to build a house or any other building, you should consider the weather conditions there. Take into account the natural sceneries such as mountains, rivers, pastures, plants, animals and the relation of them should be observed. They used to build “bird towers” outside cities in Iran. A tall cone-like cylinder with lots of holes for birds to build their nests there. One of the Imams says: “Looking at the greens and the flow of water brighten one’s eyes.” So it means looking at the greens is healing and refreshing, i.e. some illnesses are healed this way. You have noticed how healthful villagers look like? How peaceful they are? Why? Because they deal with nature. Has one’s relation to himself been observed in the architecture? “O ye who believe! Guard your own souls:” (5:105). “As also in your own selves: Will ye not then see?”(51:21). “On the earth are signs for those of assured Faith” (5:20). Inside there are signs and miracles. Don’t you want to have insight? Insight means to have a deep understanding. The main needs of humans in Imam Kadhim’s (PBUH) viewpoint: “Endeavor to divide your time into four parts. Spend some time to pray and worship God, spend some part to earn a living, spend the third part on meeting the brothers and trustworthy friends who tell you, your deficiency and love you honestly. And the fourth one is to spend time for the fun and entertainment which is legal and halal and through this step, other steps will be energized.” The third part emphasizes that not everybody but those who through them you can be trained and flourished should be kept. Are these four parts observed and provided for an individual in the present culture and architecture? Based on the mentioned narration, Islam says that one-fourth of daily time should be spent for enjoyment and entertainment. But humans work up to 12 hours or even more! It recommends to spend some time to meet and visit other people. Read Hilgard if you don’t believe in narrations. He says those who meet their relatives a lot have longer lives. They have examined those who met their relatives more and found out that their immune system is stronger. Now, what role do neighbors have in architecture? But among the rights of neighbors is to save him and to respect him when he is present and you should help him and never search for his deficiency and don’t try to explore his bad deeds- under any circumstance.” It advises not to explore in their affairs. However, in nowadays buildings where a thin wall separates units then you inadvertently hear their voice. “And if you happened to understand some bad deeds about them you should be like a castle for what you have realized.” It means you should not reveal what you have heard. The direction of houses has been discussed in Islam. “We see the turning of thy face (for guidance to the heavens: now Shall We turn thee to a Qibla that shall please thee. Turn then Thy face in the direction of the sacred Mosque: Wherever ye are, turn your faces in that direction.” The verse says that wherever you are you should turn your faces toward the Qibla. Search to see how advisable it is to sleep in the direction of the Qibla. Science has even proved it that sleeping in the direction of the Qibla is concordant with the electromagnetic field of the Earth and thus is very useful for the body. However, many people cannot place their beds in the direction of the Qibla. The architect has built the room in a way that it is impossible to place the bed in the direction of the Qibla. How many times should it be emphasized that sleeping in the direction of the Qibla brings about longevity? It is like advising which medicine to take or not to take, life will be made longer or shorter. Even sitting or eating in the direction of the Qibla is advised. Thus, the room should be built according to this viewpoint. As aforementioned, the Prophet said that we should know 40 of our neighbors i.e. 160 families from each direction. That’s why Islam says you are not a Muslim if your neighbor is hungry. This is a horizontal view, and if in this view, all rights of neighbors are defined in Islam. This is how the rights of neighbors to each other, the right of the way, street and etc. make sense. This means that 160 houses will have the same culture. But, these days there are 200 apartments in a tower. Next to it, there are ten other towers similar to that tower, inhibiting different people with different cultural traits which brings about violence and crimes. Amir al-Mumenin (PBUH) says about security: “If I am informed that somebody has a good and moral feature and he acts based on it, I accept him and I look over the fact that he does not have the other good features; however, I can’t ignore the fact that he has no religion and does not use his reason (head), since the separation from religion is the separation from security and a life without security is not pleasant.” No one likes an unsecured life. Therefore, we should see security in the quality of an Islamic city. The first thing that happens in living in apartments is the loss of security. God refers to joy and security next to family and introduces “being with one’s family” as a heavenly gift. “And grant, our Lord! That they enter the Gardens of Eternity, which Thou hast promised to them, and to the righteous among their fathers, their wives, and their posterity! For Thou art (He), the Exalted in Might, Full of Wisdom.” (40:8). The first monument of each city should be a mosque. When the Prophet (PBUH) entered Medina, he built a mosque and set it as his residing place. “The first House (of worship) appointed for men was that at Bakka: Full of blessing and of guidance for all kinds of beings:” “Curse on he who does not consider the dignity for it and downplays it.” Imam Sadiq (PBUH) says: “Whenever you decided to go to a mosque to worship God, as soon as you reach the door of the mosque, know that you have intended to meet a magnificent King. No one is merit to tread on this realm except for the righteous people and no one can feel free to sit there except for the honest ones. When you enter the Jame Mosque of Yazd, you see its 6-meter high ceiling. At the time of constructing this monument, other houses were built on one floor and this mosque had been the highest and biggest place in the city. The height has its own meaning. When you enter the mosque the area become dark. The ceiling becomes lower. 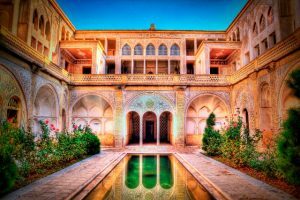 When you enter the yard you see the Shabestan, it is very beautiful. Those who say that Islamic architecture is dual, do not understand that the architects of these places realized Islam well. In Islam’s viewpoint, a house is a relaxing place. “Homes of rest and quiet for you” your house should be a place you feel comfortable and relaxed. Abu-Hamza Thumali says he went to see Imam Ali bin Al-Hussein (PBUH) and he had to wait for some minutes in the yard and then he entered the room. It shows the importance of having a yard at home. Or in another narration we read: “I got out, it was a bit after the evening prayer. I knocked the door and my brother said: Who is this? I said, Ali, he said, I will come out. Then, he came out and sat under the arch.” We understand that the house of the Impeccable Imam (PBUH) had an arch which acted like an awning. Now we can interpret that if arches are not built for showing off, then they can be considered as examples of Islamic Architecture. At that time, the halls were designated for women and men so they would feel comfortable. 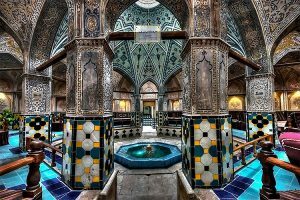 We have a narration in Usul al-Kafi that “One day I wanted to enter the men’s room where Imam was there.” From this we understand that there was a special room for men. The prayer room of the house: “We, then, entered the room and we saw that Imam was saying his prayers in the prayer room.” The porch of a house: “And we slept in the porch on the eve of Eid al-Adha.” They had porches in their houses. “Three things bring about prosperity and three brings about misfortune. The first from those which bring about prosperity is a devout wife whose visit makes you happy and will find her trustworthy in your absence. By this advice we learn something about matrimony. “The second and third ones are having a fast means of transportation which takes you to your destination and a big house which has much room.” A big house. At the same time we have a narration which says if you have a house which is bigger than you really need, it will turn out to cause a lot of hardship for you. Locating toilets: it is quoted from one of our Imams (PBUH) that: “Now, Mofadhal, ponder about the blessings the Almighty God has put in eating, drinking and ease of discharging waste from one’s body and take heed. Isn’t it wise to build a toilet in the most covered part inside a house? God has created the intestine tubes in the most covered part of our body.” Therefore, the toilet should be somehow out of sight and hidden. However, in today’s apartments, toilets overlook the whole house! Bathrooms: there are both baths inside and outside a house. In narrations we read that one of our impeccable Imams had two bathrooms in his house one for the purposes of hygiene and one for the healing purposes. A public bathroom was used as a healing place. Imam Reza (PBUH) says that a bathroom should have 4 parts, similar to a human body which has 4 humors. “A bathroom should have 4 humors like a human body. There are four humors: cold and dry, cold and wet, warm and wet and the fourth part is warm and dry. It means that a person who has a cold and wet humor should proceed up to the second part. Something like today’s Sauna and Jacuzzi. 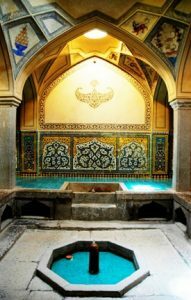 Therefore having these four parts in a bath makes it based on Islamic principles: a changing room, the first bath and the second and third bath then the cold pool. One of our Imams says “Pour some cold water on the back of your legs. This ejects diseases from one’s body.” So, as a Muslim architect I should observe these in building a pool. “Muslims’ bazaar is like their mosques. So, if someone was faster than others and sat in a place, he deserves it.” You know what it means? According to Amir al-Mumenin (PBIH) no one had the right to own the bazaar. Whomever would go into a shop earlier would have the right to sell his stuff. They would go there early morning so to reserve a place. It is exactly like a mosque. Whoever was earlier would sit in the first row. In addition to that, a bazaar should be built by an Islamic ruler and the salesperson should not pay rentals so that he can sell his articles more expensive with the excuse that he pays for the rent. An Islamic bazaar is merely a place to be at the service of people. Moreover, inside a bazaar, there were ranges of the same profession in a line, such as cloth dealers, tinkers and herbalists. The doors of the shops opened onto each other consequently the salespeople could not sell their products a high price. You see the principles? 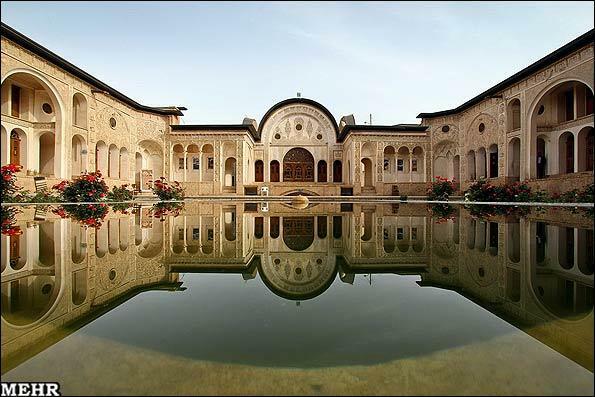 Still, we can see the old bazaars in Iran. On the other hand, Islam is not a religion to order that a sold object should not be returned. If broken to two words, “Bazaar” would mean “baz” “aar” i.e. bring it back. Buy something and return it. In this religion a salesperson is the friend of God. Heaven forbid, you go to a shop worrying that you are going to be deceived. One of our impeccable Imams says: “A person who is endeavoring to make a living for his family is like a warrior fighting in the cause of Allah.” what is there in the middle of the bazaar? A mosque. In the morning, they went there half hour earlier to the mosque and there the clergy would retell the Islamic rules on buying, selling and trading and consequently the salespeople observed them and thus would earn a halal income. But, unfortunately, these days in Islamic countries we see that a very young person who does not know much about Islam, establishes a shop for himself and is after maximizing the benefit since his viewpoint is based on utilitarianism. He just wants to buy that car, marry that girl, and buy that flat or to go to a specific party. Such a person makes lots of problems for the society. Islam says that the first thing one has to buy is a house and the last thing to sell is a house. The governments should not confiscate houses even if the owner is a debtor, you cannot take over his house. He has lived there and got used to the atmosphere and even the walls and windows like a plant which develops in a vase; it is obvious if you take the plant out, it dies. 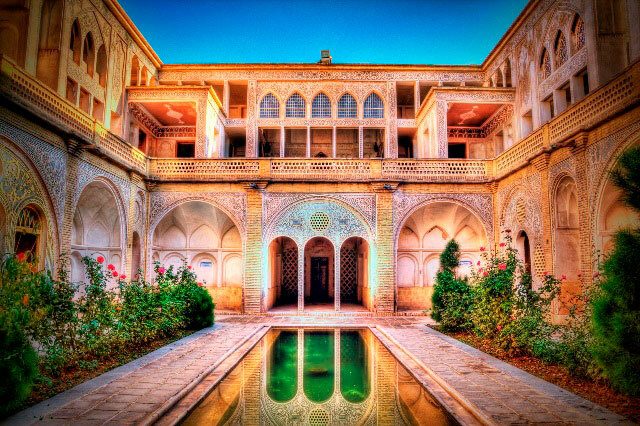 One of the examples of Iranian-Islamic architecture is the “Abbasid House” in Kashan. This house has a central yard and does not have any windows to outside. The house opens inside and enjoys privacy. It benefits from enough light during the whole day since from here and there and from the inner rooms receives enough sunrays. The house also has outside rooms and patio here. You see if there is water available or not, since Islam has recommended to look at the flowing water of rivers and lakes, as well as the greens. What are the cleansers in the Islamic viewpoint? Water and the sunrays. Therefore, there was a combination of the two in their architecture. This is an example of patio, in the “Ali Qoli Aqa” bathhouse in Isfahan. 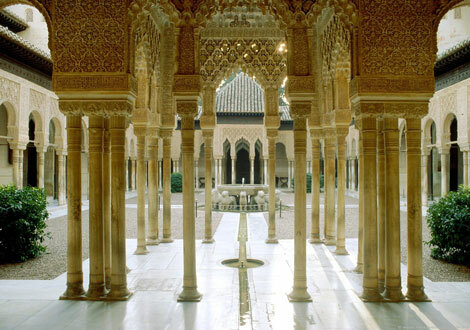 This is Spain’s “Alhambra” which was the most important place in the Andalusia, an imitation of Iranian architecture. Now, it has turned to a style of its own, among other styles such as Italian, Moroccan, Spanish. In ancient Iranian rituals i.e. Zoroastrianism, washing and bathing was very important. There were small pools built in front of temples and shrines so that people would tread into water; washing their feet and then entered the temple. A house is a kind of worship house. A house is the place of purity. It has a privacy, not everyone is allowed to come and go. Some people invite guests and let them sleep in their own room. They shouldn’t because it is their private room. No one that your wife and you should not sleep there. Even if it is highly recommended in Islam that children should knock the door and ask permission before entering their parents’ room. One’s parents room has privacy, even for kids. We have some parts in the house which are completely private, semi-private and some parts which are open to every member. Imam Sadiq (PBUH) has been narrated that we should not build our house more than four meters high. If we build it higher than that, then devils appear in it, you must keep the verses 255 and 257 of the second chapter of the Holy Quran placed in our apartment. The grand Prophet says: “Do not build your houses so high that you can have the benefit of winds blowing; unless you are given the permission.” we have some narrations which say that if we sleep in a higher place than the floor and die during the night, we should not complain of it to God. 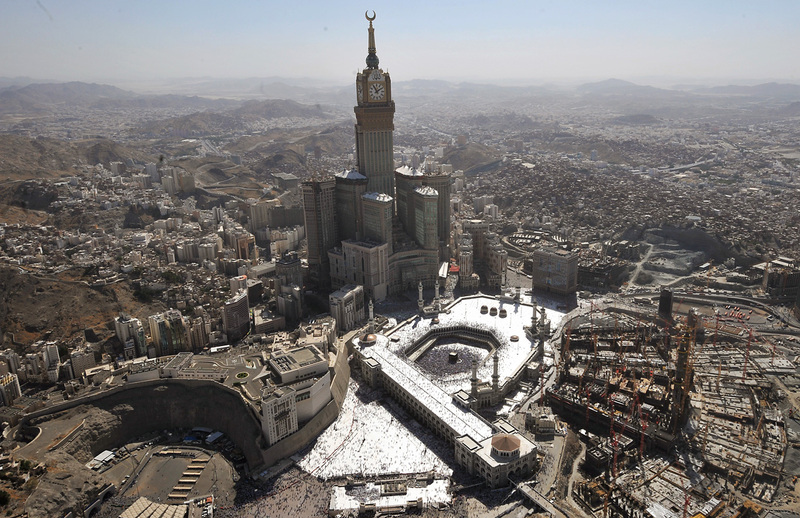 In addition, constructing buildings which are higher than mosques is reprimanded. Now, look what a building they have constructed in front of the Kaabah- the Mosque and the Qibla. Zaha Hadid and the Jewish Freemason Sir Norman Foster have constructed that building which has all the signs of the Freemasonry in front of the Kaabah. We should scrutinize deeply and epistemologically as to know why we should build high buildings? Based on what philosophy? Which school of thought? What needs of ours is satisfied by constructing high buildings? Have you noticed that building more than 50 floors costs too much? Because the glass and material used for them should be different. For each level, there should be a place allocated for people to gather there in case of emergency for instance a fire, then you need a helipad to be allocated so in case a helicopter can save the people there. So am I out of my mind to create such problems for myself? If my country is not small for this size of population, then what the reason is there to build high buildings? Of course it is required!!! For the capitalists!! To have a security for their capital. You know how expensive an apartment in a skyscraper is. However, the favorable city in Islam is a horizontal one not a vertical! The survival of anything in Islam is guarantied when it is in connection with God. In a consistent city development and planning if you look for survival, your construction should be in connection with God and divine teachings. I mean it should be in accordance with the Holy Quran and the Prophet and his progeny (Peace Be upon Him). For instance, cutting relations with relatives and those next to kin destroys cities. What does cutting relations with relatives have to do with the destruction of cities? In the Quran God give examples about cities which were carved in mountains or the beautiful gardens some people had built but all were ruined due to committing sins. Or another instance is what we read in narrations about cities in which adultery had become very popular, concluding the more adultery practiced the more catastrophes such as quakes strike. Thus, the more we try to have structures safe against earthquakes, we should also try to uproot adultery from the society. Yet, it does not mean that the architect shouldn’t think about the safety of the structure or is not allowed to do so and we just need to remove sins. Because we have a narration which says, “We define the principles and you can come up with sub-principles and rules.” It means you are free to reason. This idea is quite rational and its consequence is what you can see in the architecture which was generated based on Hadiths and Narrations and such monuments fill tourists with wonder and awe. 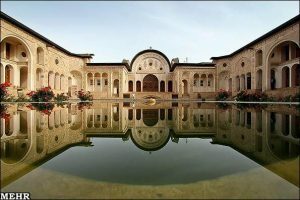 “Sultan Amir Ahmad”- Kashan, Iran. “Nassir al-Molk Mosque”- Shiraz, Iran. 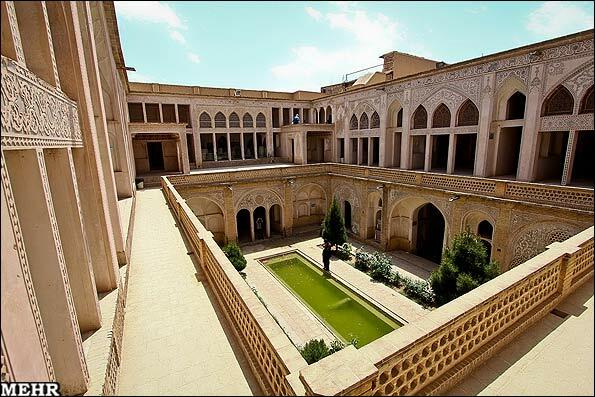 “The House of the Tabataba’is”- Kashan, Iran. The Prophet (PBUH) says that justice should be embedded in the architecture. How did we define “justice” in the beginning of our discussion? The fact that everything should be placed in its right place. But, nothing is so, nowadays. 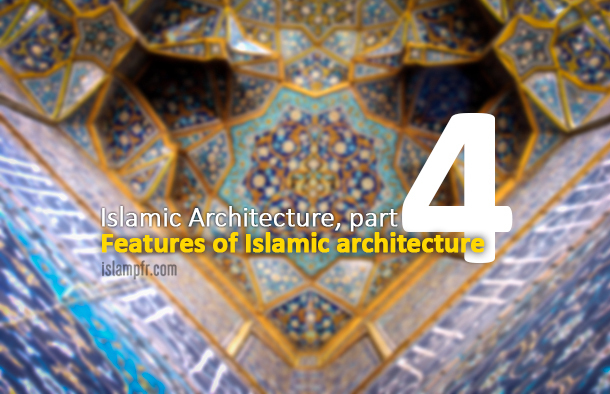 I have a question: “Why should we imitate the architecture styles which are dramatically in contrast with Islam and especially full of problems and basically two distinct concepts? What does following a western architecture school which is in sharp contrast with a Muslim’s bring about? It will change the philosophy of the Muslim and make it correspond to the western philosophy. I mean that a Muslim becomes a deconstructionist. A western ideology contains humanism, deconstruction, pivoting on human rather than God and generates its own style of architecture which is in return the product of modern philosophers’ minds. Philosophies like, ambiguity, disturbance, confusion, duality, inconsistency, deception, uselessness, polysemy and contradiction.
 . Usul-al Kafi. Trans. Kamareei, V.6, p.105.
 . Usul-al Kafi. Trans. Mostafavi, V.4, p.291.
 . Abū Bakr Muhammad ibn Zakariyyā al-Rāzī (also known by his Latinized name Rhazes or Rasis) (854 CE – 925 CE), was a Persian polymath, physician, alchemist, philosopher, and important figure in the history of medicine.
 . Tuhaf al-Uqul. p. 410.
 . Ernest Ropiequet “Jack” Hilgard (July 25, 1904 – October 22, 2001) was an American psychologist and professor at Stanford University. He became famous in the 1950s for his research on hypnosis, especially with regard to pain control.
 . Tuhaf al-Uqul. Trans. Jannati. P.423.
 . Bihar al-Anwar v.74. p.120.
 . Al-khisal. Trans. Kamarehei. Vol.1. p.140.
 . Usul al-Kafi. Trans. Mostafavi. Vol.4, p.48.
 . Tuhaf al-Uqul. Trans. Jannati. p.593.
 . Misbah Al-Sharia. Trans. Abdulrazaq Gilani. p.101.
 . Thābit ibn Safiya famously known as Abū Hamzah al-Thumālī Thābit ibn Dīnār was a close companion of Imam Ali Zayn al-Abidin. An a famous prayer is named after him.
 . Abu-Muhammad Mofadhal bin Omar Jofi Kofi, one of the Shia scholars and a companion and disciple of Imams Sadiq, Kadhim and Reza (Peace Be upon Them).
 . “The Wonders of the Creation”, trans. Tohid Mofadhal, p.66.
 . Tib al-Reza (PBUH). Trans. Amir Sadeqi. p.70.
 . Misbah Al-Sharia. Trans. Abdulrazaq Gilani. p.95.
 . Usul al-Kafi. Trans. Mostafavi. Vol.4, p.484.
 . Rawdat al-Wa’izin. Trans. 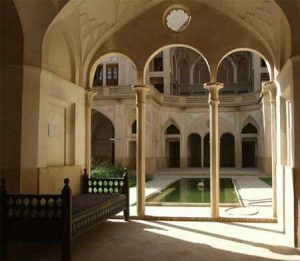 Mahdavi Damqani. p. 494.
 . Kanz al-Ummal. Vol. 9, p.58.
 . Dame Zaha Mohammad Hadid, DBE, was an Iraqi-born British architect. She was a deconstructionist.
 . Nahj-al Fesaha, Hadith: 1839.
 . Wasā’il al-Shīʿa, vol.18, p.41, Hadith: 52.